Give a Meditation Gift Certificate to someone and know that you’re giving a gift that can be used by that person for the rest of their life. 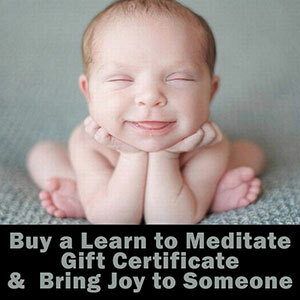 Our Meditation Gift Certificates can be used to Learn How to Meditate and to help build a strong Meditation practice. You can purchase a Meditation Gift Certificate in pre-set denominations of $100, $150, $300, $500 or create a custom gift certificate in any amount you wish (must be at least $100). These certificates are valid for one year from date of purchase. Here is a listing of the Meditation classes that this gift certificate can be used for. Once you purchase the certificate, ask the recipient to contact us and tell us which class(es) they wish to use the certificate for. (*) We can provide this class at your location outside of NYC for a slightly higher rate. Please contact us to discuss your location.